We have the perfect conditions for fly fishing! In our waters, there are rainbow trouts 2 kg and upwards with an average weight of more than 2.5 kg. The record is currently 8.5kg! Take one of our fishing courses to learn the basics or book a fishing package with accommodation. You buy the fishing licenses easily and cheap in our e-shop, or buy on-site. 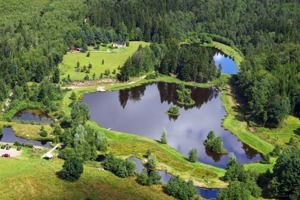 During May we arrange special fishing for wild brown trout in the nearby Lake Lillsjön. Here you will find wild brown trout - ranging up to about 2 kg. All brown trout is catch and release. Our private waters can be reserved by groups, companies or associations by arrangement, casting rod can also be used if you book in advance. Book a fishing package with an overnight stay in our cabins which are adjacent to the fishing water. For reservations, send us an email! Basic fly fishing course with instructions for all the equipment and techniques. Rent rods and equipment with a one-day fishing license included, so you can continue fishing after the course. For current dates, see the calendar on our website.